Last Friday, Gretchen and I broke away for a few hours and managed to catch Mac and Jenny Traynham playing at Oddfellas Cantina. 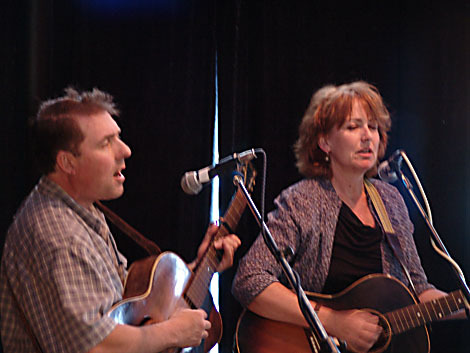 They are fine performers and have been active in the performance and preservation of the music of Appalachia. We make it a point to hear them whenever we can. Mac is a true professional. This particular night he was playing up a storm even though he was feeling poorly. But he brought along a young couple to play the second set and they did a great job. 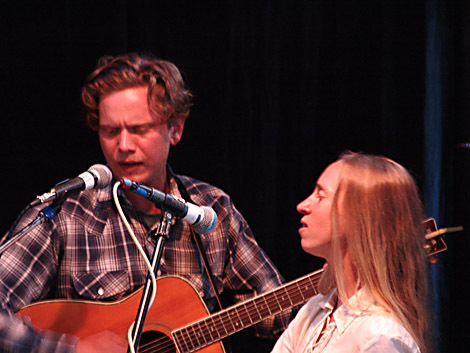 Jackson Cunningham and Anya Hinkle played a set of high energy country music. I was not able to find out much about Jackson other than he is a competent guitar player with a good singing voice. But, like so many of the people we meet in Floyd, there is far more to Anya Hinkle than a violinist with a great country voice. An avid cyclist, she competed in NCCA road races while she was getting her Ph.D. at UC-Berkely. She is now a post-doctorate fellow in the Department of Biological Sciences at Virginia Tech. I hope we have a chance to hear Hinkle and Cunningham again. Their performance was a nice follow-on to the Traynams.